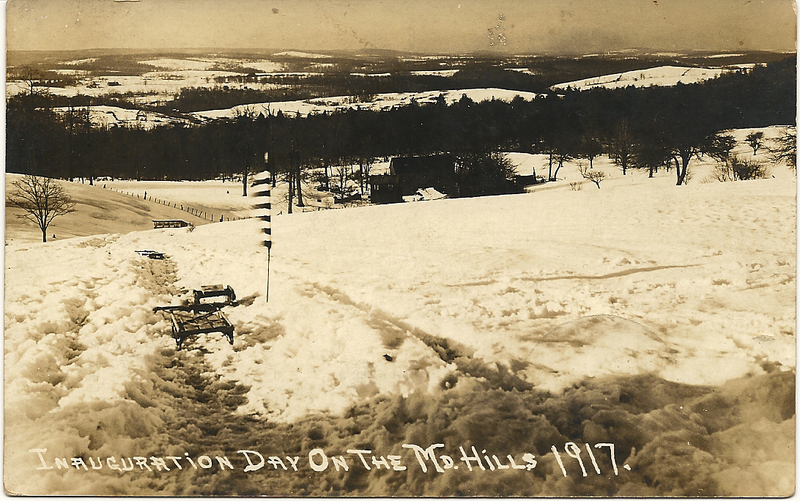 Thanks to its title, we can date this photograph, a real photo postcard by acclaimed Garrett County, Maryland photographer Leo J. Beachy (1874-1927), to March 4th, 1917–the day President Woodrow Wilson was sworn into office. Thanks to a Miss Ethel Handy, who probably bought this hand-made postcard in the town of Grantsville, we also know that it was mailed on August 23, 1917. You can view an award-winning documentary, “Leo Beachy: A Legacy Nearly Lost,” about his life, his work, and the miraculous story of the loss and recovery of his photographs on WQED’s website. Thanks to the efforts of his niece, Maxine Beachy Broadwater, more than 2,700 of the glass plate negatives were digitized and restored and placed on line at the Garrett County Historical Society. Now, anyone can order a copy of one of Beachy’s beautiful photographs on line.